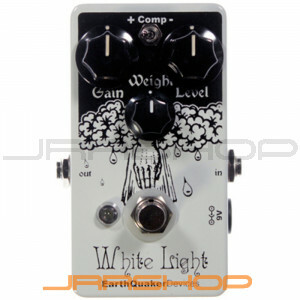 The White Light Overdrive is my take on what an overdrive should be. Based more in the area of vintage overdrives (like the DOD 250 or MXR Distortion+... and no, it's not a clone of anything) with more control over the voice and a lot more "modern" presence to make it more dynamic. Don't let the lack of tone control turn you off, what you put in is what you get out and you can adjust the low end and saturation to your liking w/ the "Weight" control.